The krona (plural: kronor) has been the currency of Sweden since 1873. STOCKHOLM – … In most Swedish cities, public buses don’t accept cash; tickets are prepaid or purchased with a cell phone text message. A small but growing number of businesses only take cards, and some bank offices – which make money on electronic transactions – have stopped handling cash altogether. “There are towns where it isn’t at all possible anymore to enter a bank and use cash,” complains Curt Persson, chairman of Sweden’s National Pensioners’ Organization. He says that’s a problem for elderly people in rural areas who don’t have credit cards or don’t know how to use them to withdraw cash. The decline of cash is noticeable even in houses of worship, like the Carl Gustaf Church in Karlshamn, southern Sweden, where Vicar Johan Tyrberg recently installed a card reader to make it easier for worshippers to make offerings. “People came up to me several times and said they didn’t have cash but would still like to donate money,” Tyrberg says. Bills and coins represent only 3 percent of Sweden’s economy, compared to an average of 9 percent in the eurozone and 7 percent in the U.S., according to the Bank for International Settlements, an umbrella organization for the world’s central banks. Internet startups in Sweden and elsewhere are now hard at work developing payment and banking services for smartphones. Swedish company iZettel has developed a device for small traders, similar to Square in the U.S., that plugs into the back of an iPhone to make it work like a credit card terminal. Sweden’s biggest banks are expected to launch a joint service later this year that allows customers to transfer money between each other’s accounts in real-time with their cell phones. Andrea Wramfelt, whose bowling alley in the southern city of Landskrona stopped accepting cash in 2010, makes a bolder prediction: She believes coins and notes will cease to exist in Sweden within 20 years. “Personally I think this is what people should expect in the future,” she says. But there are pockets of resistance. Hanna Celik, whose family owns a newspaper kiosk in a Stockholm shopping mall, says the digital economy is all about banks seeking bigger earnings. Celik says he gets charged about 5 Swedish kronor ($0.80) for every credit card transaction, and a law passed by the Swedish Parliament prevents him from passing on that charge to consumers. About 15,000 people die every year trying to cross the tracks of India’s mammoth rail network, a “massacre’’ that a government committee said was being ignored by railway authorities. The safety panel said new bridges and overpasses were urgently needed, but it noted previous recommendations to make the world’s fourth largest railway system safer had been ignored. Its report noted that railway authorities were unwilling to view the deaths of people hit by trains while crossing the tracks as train accidents. Most of the deaths occur at unmanned railroad crossings, said the report released [at the end of February]. About 6,000 people die on Mumbai’s crowded suburban rail network alone. Another 1,000 people die when they fall from crowded [train cars], when trains collide or coaches derail, it said. India’s 40,000 miles of railway track cut through some of the most densely populated cities, flanked by shanty towns, in the nation of 1.2 billion people. Railway experts say stopping pedestrians from crossing the tracks in congested areas would be virtually impossible. “The situation is exceptionally dangerous in Mumbai where four or five tracks, or more, lie parallel and people living in slums on either side have no choice but to walk across the tracks,’’ said I.M.S. Rana, a railway expert. The High Level Safety Review Committee was set up by the government in September after a spate of train accidents. Around 20 million people in India travel by train each day. The report called on the government to urgently replace all railroad crossings with bridges or overpasses at an estimated cost of 500 billion rupees ($10 billion) over the next five years. “No civilized society can accept such a massacre on their railway system,’’ the report said, referring to the crossing deaths. “Reluctance of the Indian railways to own up to the casualties, which do not fall under the purview of accidents, but are nevertheless accidents on account of trains, can by no means be ignored,’’ the report said. “Trespassing occurs because of lack of barricading, fencing, lack of adequate number of pedestrian overbridges and lack of facilities such as sufficient number of platforms, escalators, elevators for the disabled apart from insufficient train services. These are the main reasons for the heavy human death toll,’’ the report said. [On March 14], the International Criminal Court [ICC] gave its first verdict since opening its doors a decade ago, finding a Congolese warlord guilty of using child soldiers in a five-year conflict that killed tens of thousands of people. Thomas Lubanga, 51, became the first person to be found guilty by the world’s war crimes and crimes against humanity court, six years after he was arrested. Judges said he was guilty of abducting children from the street and turning them into killers during intertribal wars in the Ituri district of eastern Democratic Republic of Congo that raged between 1998 and 2003. “The prosecution has proved beyond reasonable doubt that Thomas Lubanga is guilty of the crimes of conscripting and enlisting children under the age of 15 years and using them to participate actively in hostilities,” said Sir Adrian Fulford, the British presiding judge. The legal precedents established in the case may help lawyers further build their prosecutions against Joseph Kony, the Ugandan leader of the Lord’s Resistance Army, who is wanted by the ICC on 33 charges including using child soldiers. “The verdict against Lubanga is a victory for the thousands of children forced to fight in Congo’s brutal wars,” said Géraldine Mattioli-Zeltner, international justice advocacy director at Human Rights Watch. Children are still in the ranks of armed groups and the Congolese army, and in some areas of Congo children are being actively recruited, including by force, Human Rights Watch said. The Court, and especially its flamboyant chief prosecutor, Luis Moreno-Ocampo, has faced criticism over the length of time each case is taking, and its focus on African tyrants and rebel commanders. With 700 employees, the ICC’s budget for its first decade has been [almost $1.2 billion], mostly paid for by its 120 member states. 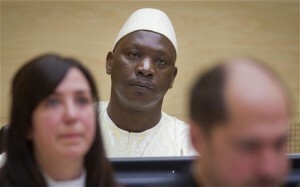 It took seven years from its inception in 2002 to the start of Lubanga’s trial, its first, in 2009. In addition to Congo, Mr Moreno-Ocampo has opened investigations in six other situations, in northern Uganda, the Darfur region of Sudan, the Central African Republic, Kenya, Libya, and Côte d’Ivoire. The chief prosecutor is also conducting preliminary examinations in a number of other situations, including Afghanistan, Colombia, Georgia, Nigeria, and Honduras. Lubanga was head of the Union of Congolese Patriots (UPC), a rebel group implicated in serious human rights abuses, including ethnic massacres, torture … and the massive recruitment of children, some as young as seven. The fighting took place in Ituri, in northeastern Congo, close to where Joseph Kony’s few remaining forces are believed to have escaped through recently. It is one of the areas worst affected by Congo’s devastating wars, which were driven by competition to control the region’s gold mines. Lubanga has the option to appeal Wednesday’s verdict, and he is likely to do so. If that appeal fails, he faces life imprisonment. b) What percent of Sweden's economy is conducted using bills and coins? - How does this compare to the U.S.? c) Do you think a cashless economy is a good idea? Explain your answer. b) What does the Review Committee say is the cause of the problem? c) What does the Committee suggest should be done to solve the problem? b) How many employees does the ICC have? c) What was the ICC's budget for its first 10 years?